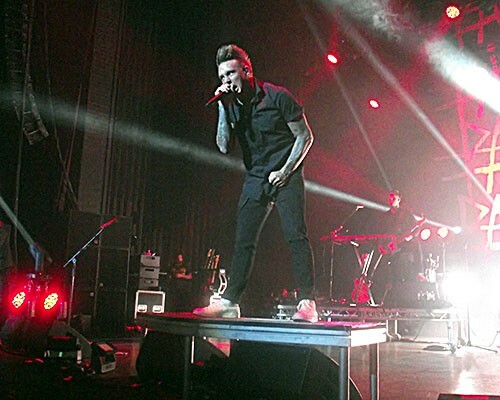 I am so used to seeing Papa Roach at the Academy building in Manchester that I thought it might have been an admin error when I first saw they were to play the Apollo Theatre on this new trek to the UK. The Apollo was the main venue for gigs up to twenty years ago – before the city (and others who were similarly minded) decided to utilise the student buildings as an alternative – and my trips there were regular, so it was good to be back again and fortunately nothing (aside from the beer prices) had changed that much. Papa Roach's most recent album, 'Crooked Teeth', has garnered much critical acclaim and has been a commercial success. The single 'Periscope' (one of the songs of the year for me) has received considerable radio play and has already been covered by another mainstream artist. The band have not really re-invented themselves since starting out in 1993, but they have developed greatly since their early Nu-Metal days and I think many people are dismissive of their talents because they still associate them with that musical genre. This is my sixth or seventh time seeing Papa Roach live and I have never gone away disappointed and am always impressed by the band's energy and commitment to their craft. I am fortunate enough to witness the first three songs of tonight's performance from the relative comfort of the photo pit, but it is still a challenge to get any photographs of quality of front-man Jacoby Shaddix as he is constantly on the move, all without ever missing a note. Guitarist Jerry Horton and bass player Tobin Esperance are also high energy performers and only drummer Tony Palermo and fifth band member Anthony Esperance (guitar/keyboards/percussion) remain in the same position during the show. 'Getting Away With Murder', 'Between Angels And Insects' and 'Face Everything And Rise' are in-your-face and attitude-filled and I can sense, without having to turn around, that the room behind me is bouncing. The sound is crisp and clear and it is difficult to concentrate on taking photographs when trying to sing along. Retiring to the circle for the remainder of the set means I have another fantastic vantage point and even high up, near the edge of the balcony, people are on their feet and totally involved with the music. 'Born For Greatness' is an anthem of a song and perfect for the live setting with no encouragement needed to join in. 'Periscope' is followed by the equally intense 'Gravity' and both songs work really well even without the addition of female vocals. The cover of Blur's 'Song 2' fits in nicely with the Papa Roach material and it is hard to believe that the half way point has been reached in the blink of an eye. When I make an exit to get a quick drink I am not surprised at all to find I am the only person in the bar. The back catalogue is then plundered for the likes of 'She Loves Me Not', 'Scars', 'Forever' and a slow version of 'Lifeline', and amongst these the newer songs such as 'American Dreams' and 'Help' already seem like old friends. A lengthy encore features 'None Of The Above', 'Blood Brothers', 'Dead Cell' and 'Last Resort' and looking over the balcony I can see an enthusiastic circle pit in the stalls, which is a mass of moving bodies. Things come to a close, after ninety minutes and over twenty songs, with '...To Be Loved' and then it is out into the rain again. No gimmicks, no theatrics, just an honest sweaty Rock & Roll show full of great songs. In the live setting Papa Roach are a force to be reckoned with and though they may be approaching middle age, thankfully they show no signs of slowing down.